The British Parliamentary Committee for Iran Freedom (BPCIF) supports the Prime Minister's statement on the “UK’s firm political support for the Saudi action in Yemen, noting that it was right to do everything possible to deter Houthi aggression, to support President Hadi and his legitimate government.” The Committee also fully backs Mrs. Rajavi’s stance, in which she welcomed as inevitable the decision by Arab countries to confront the Iranian regime. While the nuclear talks with Iran resume in Lausanne, members of both Houses of Parliament urge the UK government to adopt a firm stance against the Iranian regime as stated in the EDM342 Iran and Nuclear Weapons, a parliamentary motion supported by over 110 MPs. On Wednesday, March 25, cross party MPs from both Houses of Parliaments, prominent jurists and solicitors as well as Human and Women's Rights activists joined the Anglo-Iranian community to celebrate the Persian New Year Nowruz in the House of Commons. At a conference in the House of Commons on Wednesday, 18th March, Iraq experts and cross party panellists from both Houses of Parliament discussed the current crisis in Iraq and the essential components for a successful policy to defeat terrorist groups like ISIS and Iranian-backed Shi’ite militias. The conference's keynote speaker Struan Stevenson, who chaired the European Parliament's Delegation for Relations with Iraq (2009-2014) and President of the European Iraqi Freedom Association (EIFA), presented his comprehensive report on Iraq which concludes that Iran’s strategy for regional supremacy has facilitated the rise of extremist groups like ISIS. Sir Roger Gale MP, Dr Tahar Boumedra, the Rt Hon. 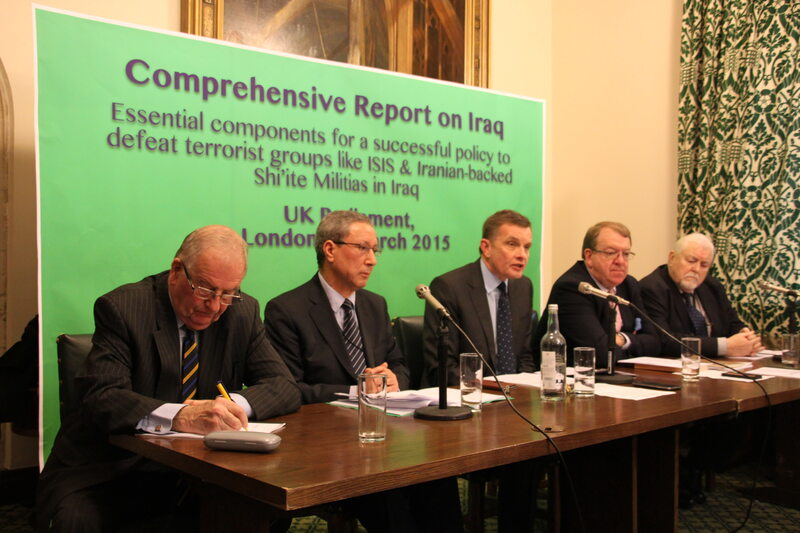 David Jones MP, Struan Stevenson and the Lord Maginnis of Drumglass, discuss Iran's destructive meddling in Iran and the threat by the Iranian-backed militia to Iraq's future at a conference in the House of Commons on Wednesday, 18th March. The conference's keynote speaker, Prof. Alejo Vidal-Quadras, President of the International Committee in Search of Justice (ISJ) and the Vice President of the European Parliament (1999-2014) presented ISJ's new report “Islamic Fundamentalism and Terrorism: Solutions & Illusions”. The report is a comprehensive study of Iran's export of Islamic fundamentalism and terrorism with the aim of offering a new different approach to counter this new global threat.